It was incredibly enriching to participate in the assessment and to see loan officers, analysts, branch managers and all these “roles” I had been reading about for a whole year finally breathing and talking in their local environments. It felt like completing a puzzle in my head, especially because the issues we tackled were very similar to those I had read about at other microfinance institutions and in other countries. Meeting the borrowers was also interesting. 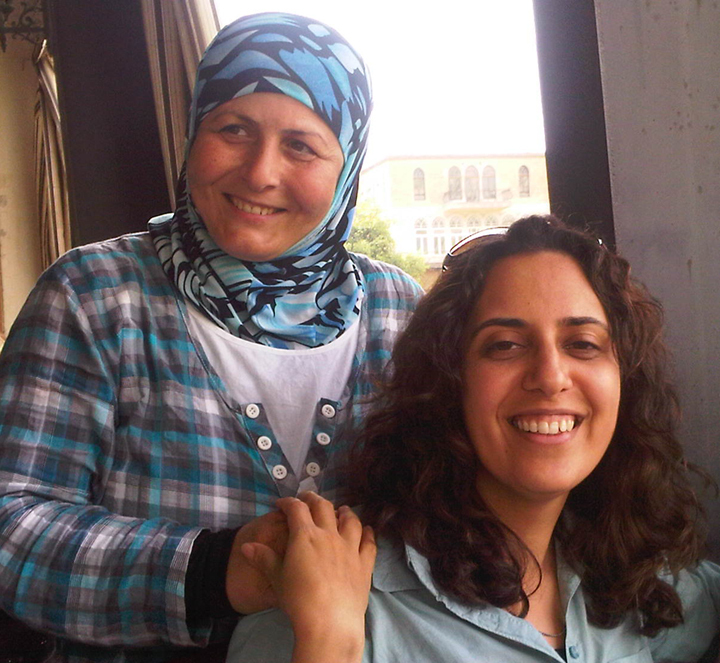 In Sidon (roughly 24 miles away from Beirut), we met Osama, an energetic woman who works as a professional photographer. Although photography is a predominately male profession in Sidon, Osama decided to take out a loan from Al Majmoua to pursue her dream of becoming a photographer. It was amazing to see her carry around and switch between the very heavy cameras as she took photographs. Osama takes photos of the places and events where men cannot go, such as women-only pre-wedding parties (girls’ henna nights), where women take off their veils and everyone dances. Her success has enabled her to buy more cameras to expand her business. In the mountains, we visited a branch in Metn, where we met some women who were just applying for their first loans (the loans are given to each individual, but there is joint liability for the group). The borrowers in the group were from different religious communities – one was actually from another country, Syria. As I looked at the group, I thought of the 15-year civil war that had devastated Lebanon. The country has made great strides since the conflict ended in 1990, but there is still a lot to be done. Al Majmoua is well aware of this cultural context, and during our interviews with staff there was a common theme – employees felt appreciated for what they brought to the organization, regardless of their background. This point is worth emphasizing in a country like Lebanon, which has been ravaged by sectarian conflict. Albert Einstein once said, “If I had an hour to solve a problem and my life depended on the solution, I would spend the first 55 minutes determining the proper questions to ask, for once I know the proper questions, I could solve the problem in less than five minutes.” Grameen Foundation’s human capital management work follows a similar approach in serving client organizations. We interview staff members from all levels of the organization to identify the current state of their practices and the gaps between the current and the desired state. Then we develop a roadmap of priorities to align those practices with the business strategy. During our meetings with Al Majmoua’s staff, we carefully selected each question, tailoring them to each target group. This was coupled with setting the right mood, to make the participants feel comfortable enough to share their ideas, opinions and concerns, but without influencing their answers. My experience at Al Majmoua confirmed what I had already learned at Grameen Foundation’s headquarters in Washington, D.C. – field officers and middle managers are at the heart of the microfinance industry. Their responsibilities are physically and psychologically demanding, and they work under difficult conditions. Their success requires the best human capital-management practices from their organizations. Meeting people who work on the front lines and behind the scenes – along with those who benefit from their service – helped to give me a new perspective on microfinance. I now have a better appreciation for all the hard work of the people working behind computer screens in D.C. who strive to end poverty and touch real lives from a distance. It is definitely worth it and, as I’ve seen first-hand, it pays off in the end. This entry was posted on September 1, 2012 at 11:41 am and is filed under Bankers without Borders, BwB-Import, Grameen-Jameel, Human Capital, Livelihoods, MENA, microenterprise, microfinance, Middle East, Middle East and North Africa, Volunteering. You can follow any responses to this entry through the RSS 2.0 feed. You can leave a response, or trackback from your own site. Ending poverty remains still a dream in almost all parts of the world. I t needs a planned strategy of empowering poor to stand on their own ,creating environment to work hard to achieve at least basic needs of life,a sympathetic and democratic government and helpful nongovernmental projects like grameen foundation. Money is required to finance these operations;however it cannot bring in the necessary instruments for changes in values,attitudes and programmes.I sincerely hope that all the people who support the micro-lending projects to extend helping hand to market products produced by self help groups .Really increase in demand for their products may enhance their earning power to bring them out of poverty and illhealth.